The Stanley Cup Playoffs kick off tonight! The guys breakdown all of the series dropping the puck tonight. They also go on record with their picks for winners of every series as well as their cup winners. The PMI Playoff Bracket challenge is live where you can enter your picks and compete against Nick, Gorms, & AQ check out @ThatsHockeyTalk on twitter for the link. The winner will have get their pick of multiple free items from Store.PatMcAfeeShow.Com. Part 2 will release tomorrow with reactions and previews of Thursday nights games. Nick, Gorms, and AQ Shipley recap one of the best games of the season with the President's Trophy winning Tampa Bay Lightning going into the Verizon Center taking on the defending Stanley Cup Champion Washington Capitals in a potential playoff preview. They breakdown who the real 2nd best team in the league is and attempt to get to the bottom of the Penguins recent late game collapses. There are some mixed opinions on the Carolina Hurricanes Storm Surge celebrations but the guys agree the Canes are for real. Plus a little breakdown for a "slumping" player and what that really means and a playoff projection for both conferences. 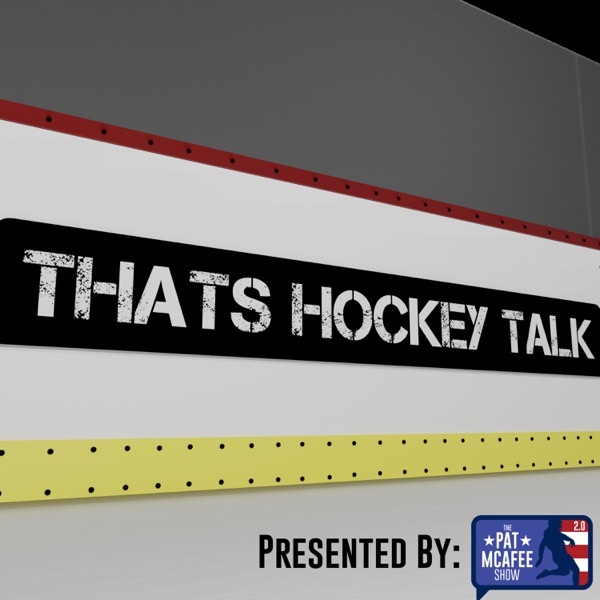 Presented by The Pat McAfee Show 2.0, in the first installment of "That's Hockey Talk," Nick Maraldo and Gorms dive into some of the hot button issues that are making waves around the NHL right now as we get closer and closer to the playoffs, talk about who they like right now, some of their most hated players in the NHL, and more as they cover everything you might've missed this week in hockey. Along the way, Arizona Cardinals center AQ Shipley will join the guys to give his thoughts on all the happenings around the league. Subscribe, rate, and review, and come have a good time with us.